^ From the Valley of Obscurity, Robeson's Baritone Rings Out; 22 Years After His Death, Actor-Activist Gets a Grammy. The New York Times. February 25, 1998 [2010-10-31]. He was befriended by Jawaharlal Nehru, Noel Coward, Sergei Eisenstein, Jomo Kenyatta, Ernest Hemingway, James Joyce, Gertrude Stein and Emma Goldman. As a writer and performer, he was a pioneering human rights advocate, speaking out against segregation decades before the civil rights movement began and singing for American volunteers fighting in Spain against Franco and for struggling union members around the country. 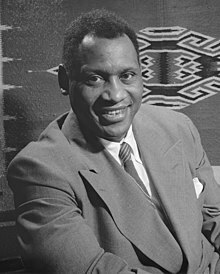 All this came at a time when discrimination against blacks was so entrenched, North and South, that Robeson was routinely forced to use freight elevators and denied entrance to hotels and restaurants. Fordin, Hugh. Getting to Know Him: A Biography of Oscar Hammerstein II. Da Capo Press. 1986. ISBN 978-0-306-80668-1.